In 1986 they formed the Floyd and Delores Jones Foundation. “We wanted to be a little more professional and organized about our giving,” he explains. When they heard about Virginia Mason’s plans for a new cancer center on the second floor of Virginia Mason’s Buck Pavilion, the couple stepped forward with a generous gift. 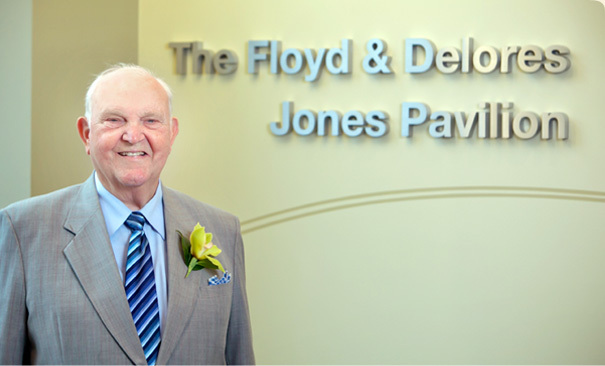 In 2004 the Floyd & Delores Jones Cancer Institute welcomed its first patients. “I’m really proud of this place. It’s helped so many people,” Floyd says. Floyd continues to work as a stock-broker for First Washington Corporation and sits on the board of the Nordic Heritage Museum in memory of Delores. “She was Scandinavian. I’m more of an honorary Swede,” Floyd remarks. He also makes time for his two granddaughters, his poetry and his second home on Camano Island. Above all, Floyd is grateful for his good health. “It’s allowed me to work hard, and to support the organizations and projects that are important to me. This is a blessing that many people don’t have,” he says.